The White House Correspondents’ Association was created by journalists on Feb. 25, 1914. Here’s a look at its first 100 years. In 1913, President Wilson threatened to do away with presidential news conferences after complaining that “certain evening newspapers” quoted remarks he considered off the record. Six months later, in January 1914, there was another flap over coverage of a Wilson press conference. This time, the regulars in the press corps responded by forming a group they called the White House Correspondents’ Association. The original mission was to keep Wilson from ending his press conferences. In the 100 years since that founding in February of 1914, the group has expanded its mission to pushing for broader access to the White House and supporting vigorous reporting on the presidency. Today, the association enters its second century fighting for openness and transparency in every operation of the presidency, from the Oval Office and the federal agencies to the traveling White House aboard Air Force One. But in those early days, the group of reporters led by William W. Price, a reporter for the Washington Evening Star and the first WHCA president, concentrated on the basics. By the Wilson administration, White House press conferences had turned into Washington free-for-alls, including hangers-on who competed with one another for “attention and for ‘scoops’ or tips that might influence the stock market,” he wrote in his account of the presidency and the media from 1897 to 1933. Wilson was generally irritable about the press fascination with his three teenaged daughters – independent young women with active political and social lives, according to Ponder. He once harangued reporters at length following a spate of newspaper stories reported Eleanor Wilson’s engagement to William G. McAdoo, Wilson’s secretary of the treasury. But Ponder reports that the consensus among the correspondents was that Wilson simply found press conferences tiresome, with a tendency toward irrelevant questions. The first question at Wilson’s Feb. 2, 1914 press conference queried the president’s thoughts on Groundhog Day. Wilson eventually quit doing regularly scheduled press conferences in June of 1915, and after that held only one more in his first term, late in the reelection campaign of 1916. The WHCA picked up its advocacy again in 1921, when Warren G. Harding revived the presidential news conference. In the meantime, the journalists forged their bonds as a social organization that would last a century. The 50 men who gathered in the Arlington Hotel at Vermont Avenue and L Street on the north side of McPherson Square that evening could not have known that they were initiating a Washington tradition, one that would annually draw 2,600 people and a national audience a century later. It was Saturday, May 7, 1921 and this was the first White House Correspondents’ Association Dinner. It was no accident that the dinner followed quickly after the arrival in town of a new president. It was only 64 days after the inauguration of Warren G. Harding and his renewal of the regular White House pressconferences that had been abandoned by President Woodrow Wilson. 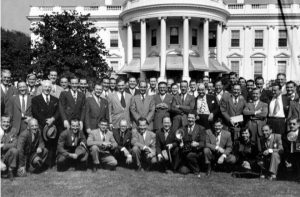 The revival of the press conferences meant the revival of the White House Correspondents’ Association, which had gone into dormancy several years earlier. The link between press conferences and the WHCA was strong. Editor & Publisher reported that the association was “recently revived to protect the presidential conferences from tipsters and press agents” by controlling who would be allowed to attend the sessions in the Oval Office. On a social level, the correspondents saw Harding, a newspaper publisher, as one of their own. One of his first acts as president had been throwing a dinner for the correspondents who had covered his campaign in Marion, Ohio. Now, it was time to reciprocate. Unfortunately, the president did not attend either in 1921 or in any of the years he was in office. The first president to attend the WHCA dinner would be Calvin Coolidge in 1924. But all of Harding’s top White House aides – particularly those who dealt with reporters on a daily basis, including the stenographers – were guests at the Arlington this night. The guest of honor was George B. Christian, the president’s personal secretary and the man who dealt most directly with the press corps every day. Others attending included Republican Senators Harry S. New of Indiana and Joseph S. Frelinghuysen of New Jersey. Also there was the first Cabinet officer ever to attend a WHCA dinner – James J. Davis, the secretary of Labor, who later would be elected to the Senate. © 2019 WHCA. Site by Happy Cog. Hosting by Media Temple.